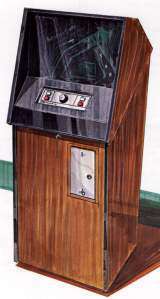 Arcade Video Game published 46 years ago by Nutting Associates, Inc.
Watergate Caper © 1973 Nutting Associates. Player feverishly twists the dial and punches the code key to reveal a mysterious combination before time runs out and he is caught by double agents. Spine chilling sound effects create suspense and intrigue. Eerie black light adds to the mystery. Watergate Caper stimulates the larceny in all of us to see if we can break in and not get caught. Players try again and again to see if they can get away with it. Watergate Caper was released in November 1973.